oyce Samuel’s Kieanjah Roberts, right, en route to an U13 Girls 200m victory over First Impression’s Amia Todman who was third and Ivan Dawson’s Ronnayah Phillip who placed second. 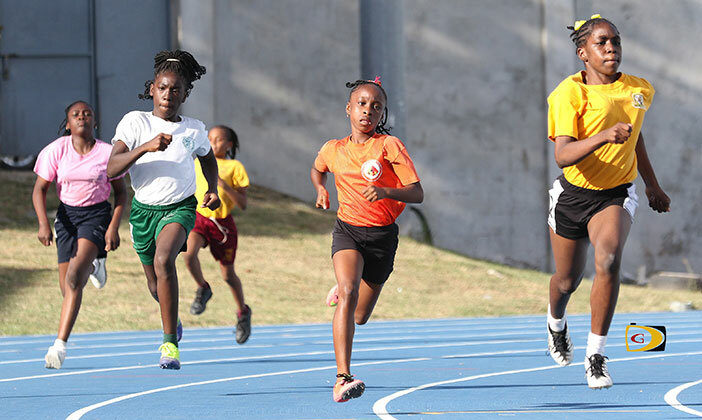 There was seismic shift among the Althea Scatliffe pursuers during Thursday’s Inter Primary Schools A Division Championships while Joyce Samuel marched to another B Division crown on Friday. Unlike a year ago when “the Mighty Scatliffe” was only able to secure just the 13+ Girls sprint crown among boys and girls and found themselves in the unusual position of trailing, this time they got strong production in the U9 and 13+ Divisions, to amass 428 points—58 more than last year. Francis Lettsome moved from third to second by holding off the charging Virgin Gorda’s Bregado Flax—who jumped from seventh to third—by four points, 283-279. There were a series of close battles for the eight division titles at stake. Althea Scattlife’s Tamri Thomas edged Bregado Flax’s Makeda Daniel by a point for the U9 Girls Division title, 26-25. Althea Scatliffe’s Tiondre Frett easily secured the Boys Division. A’Sia McMaster of Enis Adams shared the U11 Girls Division crown with St. Georges’ Chidinma Emalandu—both garnering 26. Althea Scatliffe’s Kaleem Lettsome was the Boys winner with 30. Jahtivyah Williams was two points better than Enis Adams’ A’Keela McMaster to take the U13 Girls title with 20. Kyron Walwyn of St. Georges was the run away winner for the Boys segment after securing 30 points. Althea Scatliffe’s Ariyah Smith notched 30 points to claim the 13+ Girls class while Francis Lettsome’s Kadeem Pena edged Althea Scatliffe’s Shammah Peters, 26-24 for the Boys equivalent. Althea Scatliffe’s Ariyah Smith won the Victrix Ludorum with 30 points, while St. Georges’ Kyron Walwyn and Althea Scatliffe’s Kalem Lettsome, shared the Victor with 30. 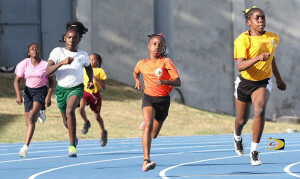 Joyce Samuel won two of the eight division titles of offer, then got solid performances in the sprints and relay, to retain its title of the Inter Primary School B Division Championships on Friday. Lenora Delville’s second place finish in the Sr. Girls Sprint Medley Relay to Ivan Dawson’s fifth place finish, separated them by one point, 229-228 heading into the meet’s final race, the Sr. Boys Sprint Medley. Dawson who needed to finish two places ahead of Delville, followed Delville in fifth place and wound up fourth behind Delville’s 230 score with 229. Virgin Gorda’s Robinson O’Neal had 168 points to finish fifth with Isabella Morris’ 136 occupying sixth place. First Impression were seventh as the the last team getting over the 100 points plateau with 118. Jost Van Dyke scored 91 to finish eight while Pelican Gate amassed 61 and Anegada’s Claudia Creque, 51. Century House Montessori rounded out the scoring with five points. Like the A Division, there was stiff competition for the top spot. The respective Division winners were as follows: U9 Girls: Sielle Cockburn of Lenora Delville 22 points. Boys: (tie) Kyle Farrington, Robinson O’Neal and Diangelo Simmonds, Isabella Morris, 13.